This tourbook features Ronnie James Dio as Ronnie sung on the concerts as a special guest. 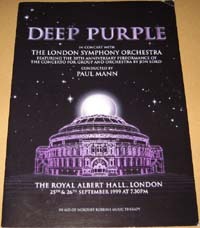 The concerts took place at the Royal Albert Hall, London, UK. 20 pages, 34.5cm*24.5cm. This tourbook features Ronnie James Dio as Ronnie was touring with Deep Purple as a special guest. Has a mail order form insert. 20 pages, 33cm*23cm.